Local legend goes that one foggy night a group of Roman legionnaires were making their way back to camp across the cliffs, east of Lulworth Cove. They were in exuberant mood and paid no heed to the dark night and poor visibility. 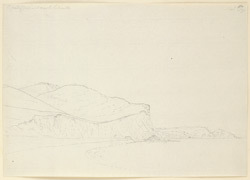 One of the men lost his footing by the edge of the cliff and, so as not to fall, held onto his comrade, who in turn clung onto his comrade, and so on and so forth...The men were so impeded by their arms and armour that they eventually fell as one great mass onto Arish Mell, the cove below Binden Hill. It is rumoured that when the night turns foggy and if you listen very carefully, you may just be able to make out the clang of armour and the desperate cries of these men crashing onto the shingle below.